What's the benefits of doing exercise with iDeer Life Under Desk&Stand Up Exercise Elliptical Stepper ? With today's busy life, it's difficult to find time to do exercise we need or spend expensive fee to be a gym member. iDeer Life Under Desk & Stand Up Exercise Elliptical Stepper make it easy and economic for you do effective exercise and burn some extra calories while watching television, reading a book at home or working at the office, or any other time when you're sitting and your legs are free. HIGHLY ADJUSTABLE. Designed with multiple resistance levels, allow you to adjust and control the intensity of your workout to match your need. Whether you want an extended, light-resistance workout or an intense session, the adjustable resistance offer you full control. The low profile and wide base prevents from rocking back and forth or hitting your knee while exercise under a desk. MULTI FUNCTIONAL MONITOR. A built-in LCD display monitor with 5 functions: time, count, distance, calories ,total count, features a very easy to use design with a turning dial for both standing and under desk exercising. SUPER QUITE. 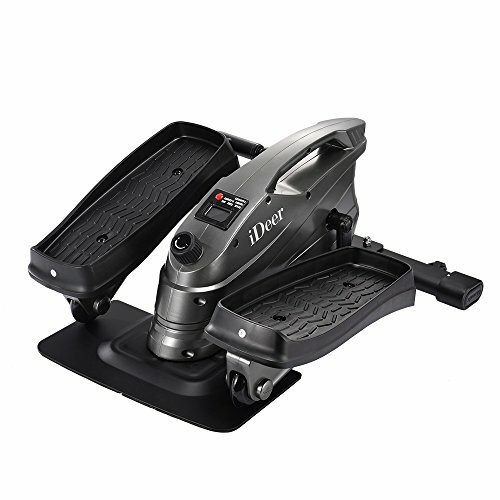 Design with brake resistance mechanism, ensure high smooth and quiet pedal motion , and the large rollerblade wheels provide you with a smoother, quieter ride, allow you to do exercise while working at office or watching TV/learning at home without disturbing anyone in the house. If you have any questions about this product by IDEER LIFE, contact us by completing and submitting the form below. If you are looking for a specif part number, please include it with your message.